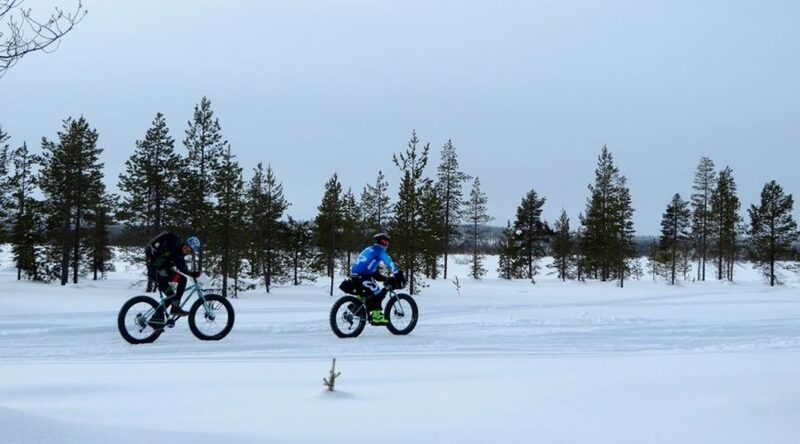 From the hand of one of our best collaborators and a benchmark in the world of cycle-touring in our country, Espai Bici, we offer you an adventure on a grand scale: To Cross Lapland on Fat Bike. This adventure began more than 6 years ago, when David Casalprim, one of the heads of Espai Bici, noticed the practice of Fat Bike in Alaska. This observation and his passion for the bicycle and alpine environments prompted him to design this adventure in Europe, specifically in Finnish Lapland. The experience accumulated through the years since the first journey and the continuous trips to this area with different variants make this adventure an increasingly consolidated and attractive proposal. The trip is made on Fat Bike, bicycles with fairly thick wheels that allow you to increase traction and prevent you from sinking into snow. Despite what it may seem by their appearance, Fat Bikes are controlled with the same ease as a normal bike, with a plus of greater safety and stability on uneven terrain. The itinerary of about 220 km runs to the north of Finland and the landscape that is crossed is varied, beginning with the great snowy forests and finishing in the great white tundra that is like a great desert covered with snow. In the following link you can see the report that TV3 did on its program “Temps d’Aventura” the Lapland in Bicycle Adventure.